Diabolical Or Psychological: The Differentiation Of Psychological Diseases From Diabolical Disorders Exorcists have written books with scary narratives detailing multiple examples of demonic activities. Sometimes they also explain how this happens and how one can diagnose the activities. However, there have been no books and no manuals by a mental health clinician or a doctor that explain the phenomenon from a scientific perspective and how it should be treated. 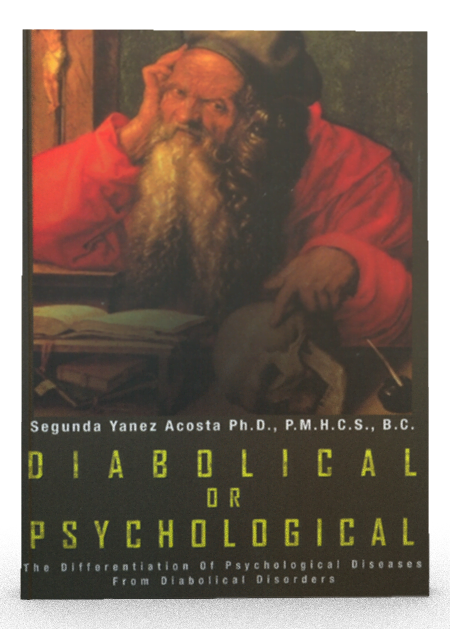 Dr. Acostas book, DIABOLICAL OR PSYCHOLOGICAL, is such a resource manual that interested persons, mental health professionals, physicians, especially psychiatrists, nurses, the clergy and persons involved in pastoral care, will find very helpful. Most importantly, it will be welcomed by those vexed by Satan and his demons, for it will empower people in the position to help with the knowledge of how to handle the situation and provide proper care, rather than backing away out of fear or ignorance. A comprehensive guide to discerning the psychological and the spiritual elements of psychiatric disease and possession has long been missing from religious and mental health literature  this book serves as just such a guide.